The president gave a rare press conference after new allegations surfaced. 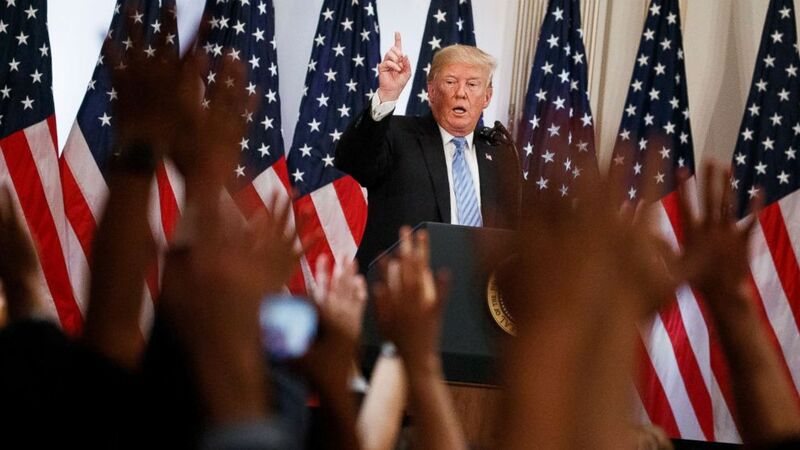 In a freewheeling press conference after a day of meetings while at the United Nations General Assembly in New York, President Donald Trump again strongly defended his Supreme Court nominee Brett Kavanaugh, but said that he could change his mind and withdraw the nomination after hearing the judge's accusers speak out. "They're giving the women a major chance to speak. Now it's possible I'll hear that and say hey I'm changing my mind. Hey, that's possible," Trump said. "If I thought he was guilty of something like this, sure," Trump said. 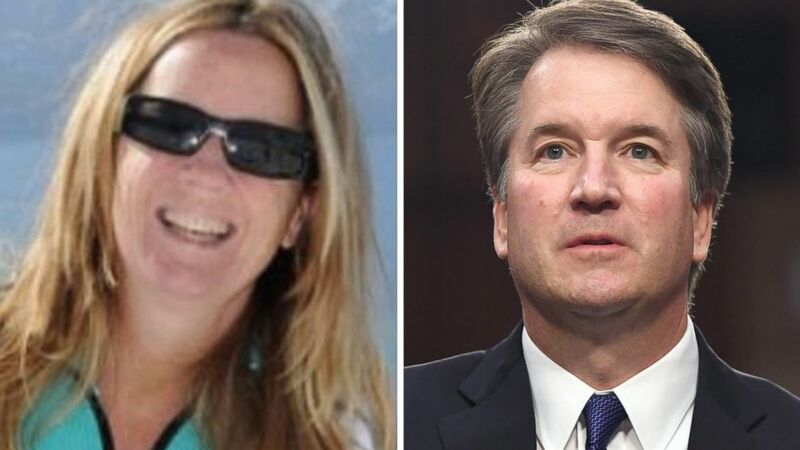 On Thursday, Kavanaugh and his accuser, Christine Blasey Ford, will answer questions and offer testimony to the Senate Judiciary Committee in much-anticipated appearances that could potentially become a watershed political moment. The president said he plans to tune into the hearing. "It's possible they will be convincing," Trump said. In nearly two weeks, three different women have come forward accusing Kavanaugh of sexual misconduct. Trump rejected any suggestion he order a new FBI investigation into the multiple sexual assault and misconduct allegations against him, including an explosive new allegation from a third accuser. "Here there was nothing to investigate," Trump said from the podium, at only his second solo news conference in the U.S. "They didn't know location, year. They didn't know anything," he said, apparently referring to the first accuser, Christine Blasey Ford, who says Kavanaugh sexually assaulted her when they were both in high school. Kavanaugh has adamantly denied the accusation and for almost 90 minutes, the president vehemently fought for his Supreme Court pick. (Evan Vucci/AP) President Donald Trump speaks during a news conference at the Lotte New York Palace hotel during the United Nations General Assembly, Sept. 26, 2018, in New York. "It's not going to change the Democrats' minds," the president said. "They destroyed a man's reputation and they want to do more." Asked whether he thought all the women were liars, Trump said, "I won't get into that game. I only tell you this. This is one of the highest quality people that I have ever met. And everybody that knows him says the same thing. And these are all false, to me. These are false accusations in certain cases, and certain cases even the media agrees with that." But when pressed again, Trump said "I have to watch tomorrow. I have to read." President Trump on whether there's a possible situation in which he would withdraw the nomination of Brett Kavanaugh: "If I thought he was guilty of something like this, yeah, sure." The president said that a female nominee could also be at risk of harassment charges and even added – jokingly – that President George Washington may have had untoward accusations against him. "If we brought George Washington here and we said we have George Washington, the Democrats would vote against him, just so you understand. He may have had a bad pass. Who knows? He may have had some I think accusations made." Multiple times during the press conference, reporters asked the president to consider his message not only as the president but as the father of daughters, as the #MeToo movement has forced a cultural reckoning and a moment of national introspection. Trump admitted it's a "big moment for our country" but said it's "because you have a man who is very outstanding but he has very strong charges against him probably charges that nobody is going to be able to prove." "Always I heard you are innocent until proven guilty," the president continued. "I have heard this for so long, and it is such a beautiful phrase. In this case, you are guilty until proven innocent. I think that is a very, very dangerous standard for our country. With that being said, I look forward to what she has to say. I also look very forward to what Judge Kavanaugh has to say. I think it is going to be a very, very important day in the history of our country. Still, Trump said that he wishes the women would have reported their allegations years before. "It's a very tough situation for a woman. There's no question about it," Trump said. "And in some cases, they do report it. Frankly, had they reported it, it would have been pretty amazing, wouldn't it? But I guess they didn't. And that's okay. I'm not saying they had to report it. Because it's a very personal thing. It's a very big problem. There's no question about it." At one point, Trump appeared to sympathize with Kavanaugh and said over the years as a reality television star and Manhattan real estate mogul he faced four false accusations against him. "I'm a very famous person, unfortunately. I've been a famous person for a long time but I've had a lot of false charges made against me, really false," Trump said. "People want fame. They want money. They want whatever," he added. On Thursday upon his return from New York, the president plans to have a face to face meeting with Deputy Attorney General Rod Rosenstein. Sources told ABC News that, according to the memos, Rosenstein told then-acting FBI Director Andrew McCabe he could recruit members of the president’s Cabinet to invoke the 25th Amendment to remove Trump from office for being unfit. Rosenstein has said: “I never pursued or authorized recording the President and any suggestion that I have ever advocated for the removal of the President is absolutely false." Trump said that on Monday during a private meeting at the White House, Rosenstein denied the allegations. "I am talking to him. We had a good talk. He said he never said it. He said he doesn't believe it. He says he has a lot of respect for me, and he was very nice. We will see," Trump said, adding that his preference is to keep his deputy attorney general in his current role and "let him finish up." Earlier in the day, Trump slammed China over their trade practices and accused the country of meddling in U.S. elections. Trump said that evidence will come out pointing to interference. "We have evidence. It will come out. I can't tell you now," Trump said. On Sunday, a Chinese backed media company published full-page ads aimed at farmers potentially affected by escalating trade tensions between the United States and China. "They have actually admitted they are going after farmers," Trump said. Trump has not held back this week in New York, taking a severe tone even with longtime ally Canada over trade. Trump said he rejected a one-on-one meeting with Canadian Prime Minister Justin Trudeau on the sidelines of UNGA because his tariffs are too high. But despite his sometimes combative tone with allies during the week, he sought to correct the record about whether or not United Nations members laughed at him during his speech on Tuesday after he touted administration achievements.